I used to make resolutions every year. And every year, two weeks into January, I’d fail. Lose 10 pounds? No thanks, I’d rather eat this cake. Read 50 books in a year? Oh, look! A Friends marathon! Be calm and patient with my kids all the time? Oops. Forgot to eat lunch and now I can can’t control my emotions because I’m so. hungry. My brain is too cluttered to focus on a specific resolution. I’ve tried. I really have. But I’m the type of person that can’t stray off course and find her way back. Once I’m off the path, I’m off. Done. I have to wait until a Monday or the start of the next month to start over. It’s one of my weird tendencies, I guess. So last year, I decided to jump on board the “One Word” wagon. If you haven’t heard of this idea, instead of making specific resolutions, you would pick one word to focus on throughout the year. Last year I chose Intention. I wanted to be more intentional in my life. Intentionally writing, intentionally parenting, intentionally living. You get the picture. It worked out so well! Life changed in major ways last year and having a focus on being intentional made things less chaotic and more enjoyable. I could focus on the important things and let the rest go. This year took a little time to figure out. There are so many amazing words out there! I have a lot of dreams rolling around in my head. Dreams I’m too scared to write out, dreams not many people know about. My home is also a little crazy with three homeschooled kids and a husband that’s half way across the world. So when I was thinking about my word for this year, I had trouble coming up with something that could encompass all of that. Finally, I was having a conversation with my mom (I think this was December 30th or 31st) when she said the word nourish. And I just knew. 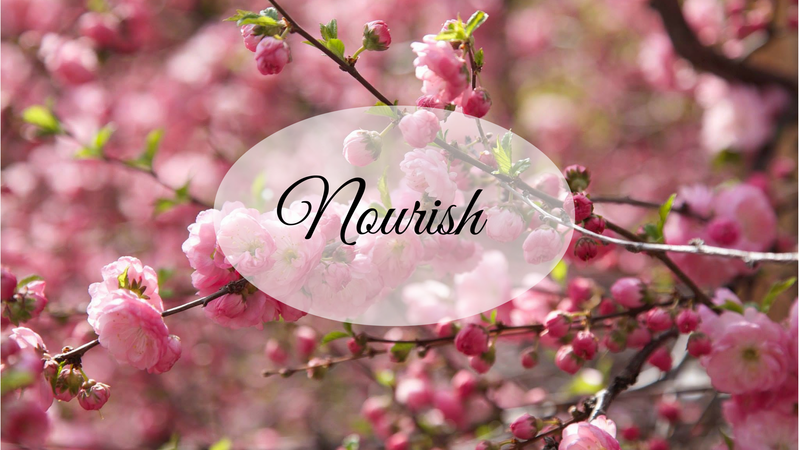 Nourish will be my word for 2016. I’m going to try to focus on things that will nourish me: mind, body, and soul. Things like books, painting, music, laughter, learning, photography. Exercising and healthy foods. Bible study, church, building a community. I’ll focus on nourishing my marriage, my family, my relationships. And I want to start focusing on nourishing my community: giving back, volunteering, noticing when help is needed and stepping up. Most importantly, I’m going to try to steer clear of the things that drain me. Usually that includes overdoing it on something: food, Netflix, relaxing. I won’t be perfect at this. There will still be nights when I fall asleep with Gilmore Girls playing in the background and wake with mascara under my eyes. I’m positive I’ll have days where I drink too much coffee and not enough water. I’ll wake up late and miss my Bible study. But that’s okay. This is gradual. Hopefully, by the end of the year, I’ll look back and be able to see that I’ve nourished myself, my family, and my community. How do you set goals or evaluate your life? Do you pick one word or do you have specific resolutions? That’s a really good word with so many beneficial meanings. I love this! Nourish is great work, especially when life can be overwhelming. My word for this year is “dare.” I shared a bit on my blog too if you’re interested. Last year I did both resolutions and one word. This year I am just sticking with one word. 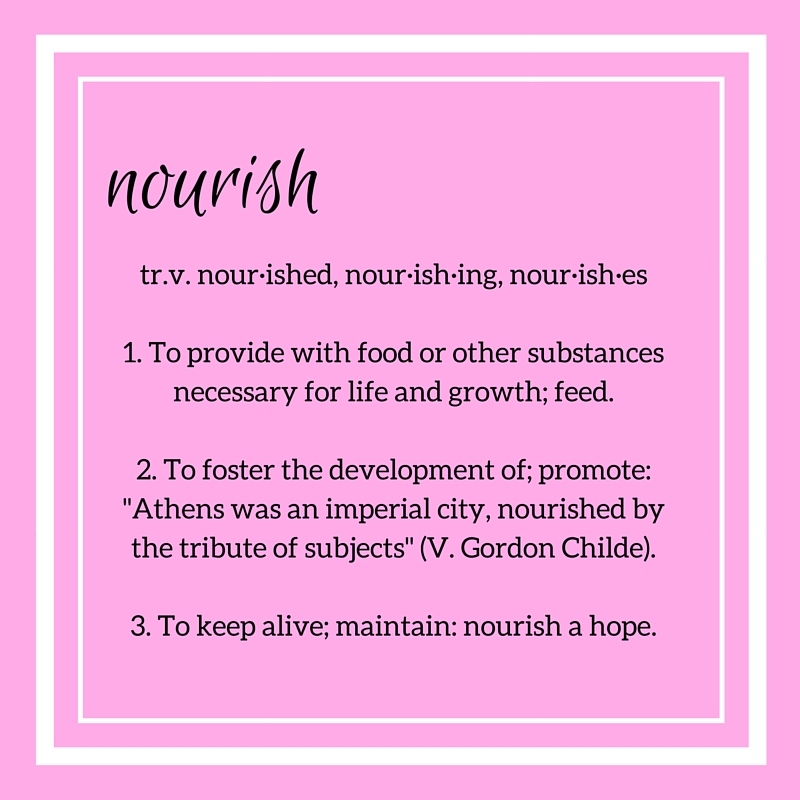 I love the word nourish. I haven’t heard or read of anyone else with that word. I think it’s going to be a great year! I love the focus upon one word for the year. It’s wonderful reading how everyone discovered their words. Here’s to a great 2016! I pray so much HOPE is nourished in you and for you this year of 2016. God bless you! What an original word! I love it! Mine is Fearless for this year! Awesome word! It encapsulates so much! I love this word. It’s so rich and has so many layers….2016 is gonna be awesome! I can’t wait to read all your words!